Tourist Information Centre Walk 48 at Explore Winterton-on-sea01493 846346work Walking RouteExplore Winterton-on-Sea village on this easy 1.5mile walk, suitable for all levels. 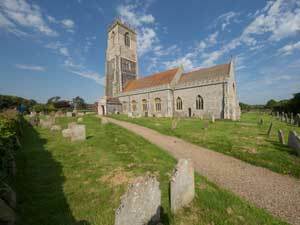 See the lighthouse, thatched cottages, the large village church and beautiful greens. This is a circular walk starting and ending at the WInterton Dunes Café a firm favourite with visitors and locals so why not stop for a comfort break and a cuppa and see if you can see any seals playing off the shoreline. There are a few areas of shelter along the route but no public factilities. On arrival in Winterton-on-Sea, drive down Beach Road. The walk starts from the car park on the left.